The Action Congress (AC) has asked Iyiola Omisore and all public officials whose elections were nullified by the courts to refund to the public coffers every kobo they collected while serving without mandate. In a statement issued in London on Thursday by its National Publicity Secretary, Alhaji Lai Mohammed (who is part of an AC delegation that is currently meeting with the chairman of the British All Party Parliamentary Group on electoral reforms in Nigeria), the party said it was unfortunate that a man without mandate has held a key post in the Senate as chairman of the Appropriations Committee, in addition to serving 30 out of 48 months. ``This brings to the fore the urgency of electoral reforms, the need to ensure that no elected official assumes office until all petitions against his/her election have been disposed off, and for elections to be held six months ahead of the expiration of the tenure of the incumbent administration, as recommended by the Justice Uwais panel but thrown out by President Umaru Yar'Adua. ``It is worth noting that while serving as a Senator without mandate, Omisore terrorised the opposition, even in matters that did not concern him, like the governorship re-run in Ekiti. 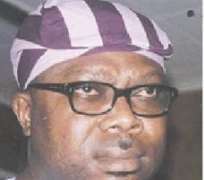 We recall that this acting Senator was flown to Ekiti in a police helicopter for reasons yet unknown,'' AC said. The party hailed the judiciary for showing that some institutions in the country have not been overwhelmed by corruption, and commended Jide Omoworare, who challenged Omisore's election, for his conviction and courage. ``It takes conviction and courage to take on a man like Omisore, who has a massive war chest from his days as deputy governor and a one-term Senator. We want men like Omoworare, who cannot be intimidated. ``It is precisely because we don't have many men like Omoworare, because we have stopped asking questions, that the PDP has continued with its electoral heists,'' AC said. The party said the fact that Omisore's election was annulled on the basis of wide spread violence and malpractices, among other reasons, shows that even he as a former deputy governor and serving Senator, as well as his party (PDP), were not on ground at all during the elections. ``This shows that all the PDP relies on to win elections is brigandage!'' it said. AC expressed the hope that the re-run ordered by the court would have credibility, saying it provides yet another rare opportunity for President Yar'Adua to demonstrate his administration's so-called commitment to electoral reforms.